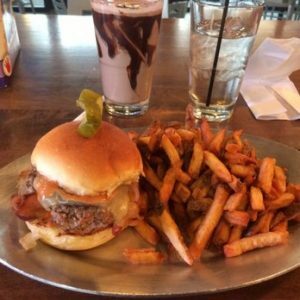 An unexpected burger joint, right in the middle of the famed Playhouse Square neighborhood is the perfect lunch spot before a show or during a long workday. People love the simple, but perfect menu, prices and the location — but only wish the hours were extended so they could stop in more often. The menu features 7 specialty burgers including “The Parallax Burger” (White Cheddar Cheese, Red Onion, Bacon, Barbecue Mayo), “The Kafeteria Burger” (Swiss, Sauerkraut, Russian Mayo, Crispy Salumi), and “The Dynomite Burger” (Jalapeno, Red Onion, Pepper Jack, and Spicy Mayo) all of which come in at $8. In addition to these great burgers, there is also a wide range sides including chili fries, salads and pickles. They range from $1.50 – $4. This is one of the biggest reasons people love Dynomite, they offer great foods at great prices. They do offer alcohol, and again it’s a pretty slim menu. They have a couple beers on draft at a time for $6 and they have three wines that all are $6 a glass/$24 a bottle. The menu includes Chardonnay, Pinot Grigio and Pinot Noir. The location is the other great selling point of this place. It is walking distance from multiple office buildings, making it a great spot to have lunch with coworkers. It’s also in the perfect stop for a cheaper, pre-show bite. 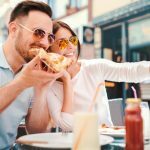 Most of the restaurants around the area are high-end, sit down restaurants which are great, but aren’t the best choice if you’re looking for a quick, affordable place. The facility itself is also a selling spot for the burger joint. It’s a quaint, little green hut in the center of the bustling Playhouse Square neighborhood with a direct view of the famous Playhouse Square chandelier. This makes for a wonderful place to sit, relax and watch everything pass by without a care in the world. The downside for this great spot is the hours, unfortunately. Being placed near these great theaters might make people think that it would be open later into the evening so people could stop in after a show, too. Dynomite is open Monday through Friday 11 am to 3 pm. Fans of the restaurant would love to see this great place extend their hours to the weekend, a time where they often find themselves in the Playhouse Square district. 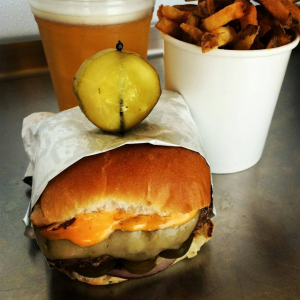 They do have a location in the Cleveland Indians’ stadium, Progressive Field as well, so if you find yourself in the stadium craving a delectable burger, be sure to make a trip to the Dynomite stand! 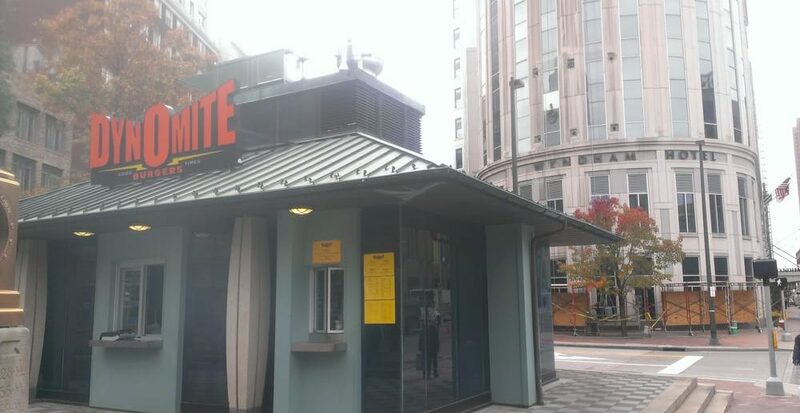 Overall, Dynomite Burgers is a great place and people want more of it! With a succinct, delicious menu, central location and reasonable prices, it’s the perfect lunch spot. Here’s to hoping they will take the hint and extend their hours in the future. Stop in at the Playhouse Square location at 1302 Euclid Ave, Cleveland, OH 44115. Contact the restaurant by phone at Phone number (216) 298-4077 or visit the website here.